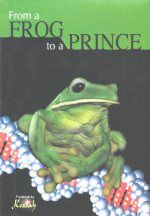 From a Frog to a Prince challenges the evolutionists claim that ancestral amphibians changed eventually into people just by chance and natural selection. Such major biological change needs new genetic information. Where could it come from? At Oxford University, a prominent defender of Darwinian evolution, Dr. Richard Dawkins, says the selective accumulation of lucky mutations can explain it. This view is challenged by biophysicist, Dr. Lee Spetner, in Israel, and by molecular biologist, Dr. Michael Denton, in New Zealand. In Germany, Dr. Werner Gitt, an information scientist, explains that evolutionary processes cannot produce new information. And in Australia, biologist Dr. Don Batten shows there are clear limits to biological change—frogs will always breed frogs.